Eventbrite is an online platform to plan, promote, host and manage events of every kind. 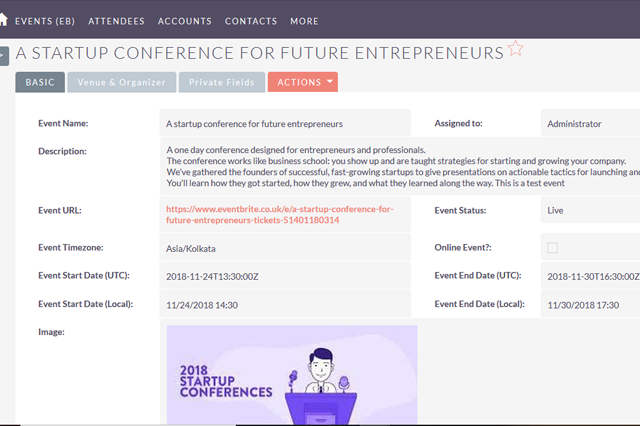 When your events are organized with Eventbrite, our SuiteCRM Eventbrite integration brings you an option to synchronize those event and attendee details to SuiteCRM as Custom Events module and Attendees module. With the event details inside SuiteCRM, you can make sure to have better interaction for a good customer relationship. Get your EventBrite Event's information and attendees into SuiteCRM. Turn your event attendees into sales leads or contacts for post-event marketing. Sync event information directly into your SuiteCRM and eliminate manual data entry. Automated Nightly Sync: The integration gives you an option to enroll in a nightly sync of Event and Attendee information to your SuiteCRM. On Attendes you will have upto date status like, Checked In, Cancelled or Refunded etc. At Urdhva Tech, we continuously endeavor to deliver world-class SuiteCRM Development services that help develop a competitive advantage for your business. We have amongst us, some of the best SuiteCRM Developers having sole experience of 10+ Years on SugarCRM, who can help you in streamlining business processes and reducing operational overheads. Our services are not only cost-effective but also best in terms of quality.